Anyone know where I could get a large number of these in Winnipeg? 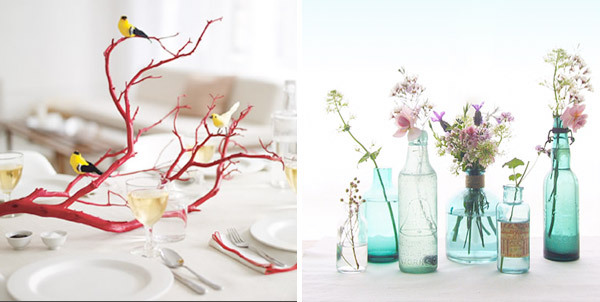 Just an idea, but if you can't find similar colored vases, you could dye the water the same color with food coloring. I remember my dad having a bunch of funky shaped glasses on a windowsill that were all filled with water dyed beautiful colors. It was really neat. Thrift stores are always good for those kinds of things, plus you can probably buy the mason type jars in the bottom right hand photo at the super market, or someplace that sells home canning things. Good luck, the inspiration photos are lovely! ooh, yeah, we have some mason jars already - a bit smaller than I'd like though. Where do I get larger mason jars? Can anyone recommend a favorite thrift shop for home items? I usually just go to value village in polo park or on pembina. There's a salvation army on sherbrook a few blocks South from portage, but it's a one way street. I haven't checked it out yet. I know the walmart near polo park sells mason jars. There are a bunch of little shops on Corydon that have many coloured vases. Academy has a bunch of those shops as well around Academy Lanes area. Sorry I can't help much more. I'm newish to the city and directionally impared. Definitely thrift stores and might be worth checking out the dollar store. Thanks for the thrift store recommendation... I went to value village and the salvation army in polo park and got lots of vintage mason jars and clear vases. Still can't find any nice coloured vases though. That's a job for tomorrow! Dollarama had a bunch of different ones the last time I was there.